Super Prime Salmon Dates & Half days available. Half Day Afternoon salmon trips open almost every day. 10/9 Update: We had a good soaker rain last night in the North country. Water levels spiked and brought a ton of bright salmon in this morning. Lots and lots of bright King and Coho Salmon. We also landed two adult Fall Steelhead today. Should be and excellent Fall Steelhead year! Tim displays a gorgeous King salmon from today. Cooler weather and rain has made for some exceptional salmon fishing! Fall Steelhead coming soon! Absolutely crazy numbers of both King and Coho Salmon. Afternoon trips are fishing very well. Starting to see good numbers of King Salmon in the lower Pere Marquette River. Casting Thunderstick crank baits have been fishing well. Should be an excellent year for salmon with the number of fish that are already in the system. It’s not even Labor Day yet and there’s already a ton of salmon entering the river system. As we enter mid September, the Pere Marquette River has received most of their Fall salmon for the main run.Chinook salmon will continue to migrate the PM but the main push was around September 15th. Those salmon are on a mission to hit gravel in the fly water near Baldwin. “Flies Only” section of the Pere Marquette should be in full swing during late September. Kings are much later this season so they should be interesting to land on the fly. Big Manistee River is where it’s at! Big numbers of big fish this season! 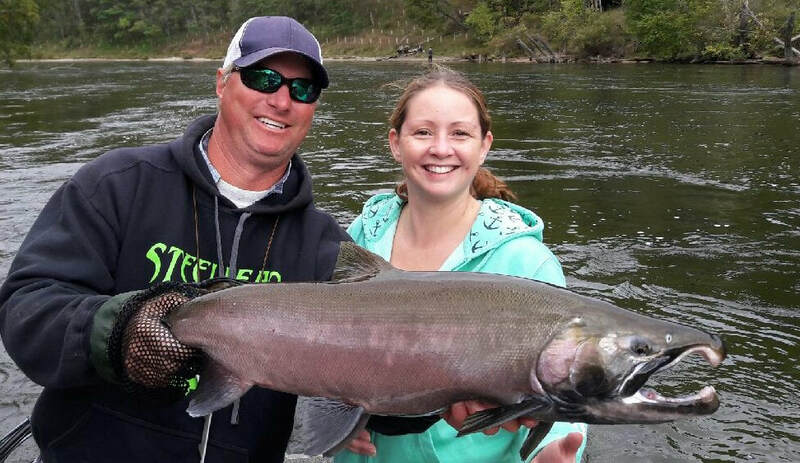 The largest push of Kings on the Big Manistee River was in early September. Nearly 20,000 adult Coho salmon entered the river and made their way to the coffer dam at Tippy. There have been a lot of Coho and King Salmon above the coffer dam. Limits have been pretty common with more fish on the way. Kings are a little behind this year so later September and October should offer some excellent salmon fishing well into late October. Gravel fly fishing should be excellent this fall season. Following on the shirt tails of the King, Steelhead are close behind! Late October and November should have us craving chrome with a vengeance. Water levels are up in Lake Michigan making for a good fall migration this Fall. What’s Hot – Best Techniques. Casting Thundersticks has been the tried and true for the past decade. Fire Tiger and bright chartreuse colors get bit very well in the early morning fog. Bone crushing hits and fierce head shakes keep anglers coming back for this adrenaline rush! Kings love Thundersticks and crank baits. Casting across and down has always worked best in my experience. Pin to win! During the mid day, floats and skein is always our best guide “Go to” technique when the sun is high and bright, Salmon, both King and Coho love to find deep pools or shady pockets. Floating skein to these fish usually gets them fired up! Change your skein often and keep your bait fresh. Chuck and Duck Fly Fishing. When salmon go to the gravel, there’s only one way that really gets ’em. Long leaders with a trout bead, followed be a dark stone fly or hex nymph usually gets their attention. Male salmon are designed to fight off predators and protect the nest. (Salmon redd) So intruder patterns such as trhe “Egg Sucking Leech” get salmon to move when nothing else will. Big nymphs or streamers can pay high dividends when you can get the flies directly in front of the spawning salmon. Main ports like Grand Haven, Muskegon, Ludington, and Manistee are starting to report good catches of King Salmon coming in close along the pier heads and along the beach. It’s unheard of but, our guides have already started catching Kings in Muskegon and Pere Marquette Lake. It’s been years sonce salmon have entered the river this early. We will begin running Salmon trips on the Lower Pere Marquette River starting on August 20th. Shawn Babcock and Chad Schaub will start running Thunderstick – Skein fishing trips early this year. Guided Salmon Fishing Trips will be available for Aug. 20th – October 20th. These trips include use of our gear, tackle, rods, reels, fish cleaning, etc. Everything is included in our Salmon Trips. We offer both Spinning Gear, and Fly Fishing Tackle later in the season. We are running (5) full time salmon fishing guides this season, and offering two guided trip choices. Afternoon Trips begin at 3:30pm – 8pm.